﻿ KONIS-B – KONČAR Elektronika i informatika d.d. DC power supply system, type KONIS-B is designed for uninterruptible power supply of important energy facilities, such as hydro power plants, thermal power plants, transmission and distribution substations. The DC power supply system type KONIS-B is designed for uninterruptible power supply of specific DC loads whose reliable operation is of particular importance. The system provides automatic charging and maintenance of the connected batteries, and simultaneous supply of loads. Rectifier modules type BFS operate in a redundant parallel operation with equal distribution of load current. In case of possible rectifier failure the faulty rectifier module selectively switches off, while the others continue to supply the loads and the battery. The principle of redundant output power gives the maximum reliability of supplying. By adding a parallel rectifier modules it is possible to increase the output power. The modularity of the construction enables simple replacement and installation of rectifiers, which is a prerequisite for fast and efficient servicing. Rectifiers are robust and naturally cooled, fanless, which further increases their reliability and availability. Distribution board is produced with special DC circuit breakers, designed so as to ensure mutual selectivity in all outgoing feeders and in all operating conditions. 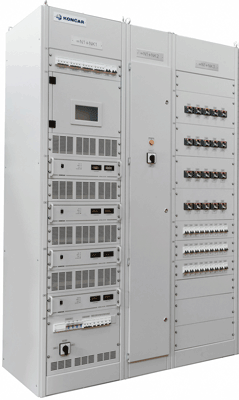 The cabinet has direct access to all circuit breakers allowing status checking and quick manipulation. The operation of the power supply system is controlled by a microprocessor control unit, type KONLOG. It manages the system in real time and enables parameter setting, local and remote insight into measurements and signaling. Communication with the station computer, dispatch center and specialized service center is possible, which greatly contributes to reducing maintenance costs and to additional increasing of the reliability and availability of the entire power supply system.